In the past month, there has been the premieres of three very different medical shows: Royal Pains, Nurse Jackie and HawthoRNe. A talented doctor at the best hospital in New York decides that a board member is stable enough for a surgeon to handle so he goes to help out an unstable, non-board member patient. That patient survives and board member has a freak turn around during surgery and dies. The talented doctor gets blackballed from practicing medicine. After his fiance has enough of his wallowing in self pity for a month, she leaves him. His brother drags him to the Hamptons for the weekend where one thing leads to another and he becomes the concierge doctor to the very rich and pampered. There is nothing shocking or unpredictable about the pilot except for Campbell Scott’s very bad German accent, but Mark Feuerstein who plays Dr. Hank is very charming. His brother Evan, played by Paulo Costanzo, is adorably dorky. They get a place to live for the summer so they set up shop. It is a perfect match up with Burn Notice and perfect show for summer. I recommend it. Nurse Jackie is a very well-rounded character. One moment, she is pathetic with her addiction to painkillers, which she snorts, to deal with her chronic back pain. The next moment, she is sympathetic since she fights for her patients when the doctors are sometimes too new and clueless to know what’s best. After that, you are laughing at her eating lunch with another doctor when a nearby person starts choking and neither one of them wants to do anything about it since they are “off the clock.” Finally, you are back to seeing how messed up her life is since she has a secret doctor boyfriend at work, who has no idea she is married with two young daughters because she takes her wedding ring off before going into work each day. She doesn’t sound very likable, but Edie Falco makes it work. I enjoyed the supporting cast that were briefly introduced in the pilot and look forward to seeing more of them, especially Mo-Mo, played by the beautiful Haaz Sleiman, who I became a big fan of after watching him in The Visitor. I look forward to laughing out loud at more very inappropriate black humor, which is what really makes me like the show. My feelings for this show can be summed up at my laughter when I heard on a radio ad this morning about this “ground breaking” television show. There is nothing ground breaking about it. It is extremely bland and predictable. It begins as annoying when Nurse Hawthorne is shown talking to her husband’s ashes a year after he has died. Then she is mistaken for a homeless lady when she comes running into the hospital from her bed to help a patient on the roof that is about to jump. The security guard doesn’t recognize her and apparently no one else works there at that time that would recognize the head nurse lady. She is supposed to have some faults, but they are tame. She is pretty much a saint, which makes her boring. I wanted to check it out because it stars Michael Vartan, but his character is Dr. Feelgood and not in a good way. He’s just friendly in the boring and bland way. I feel if I watch any more episodes, I’ll just fall asleep. I recommend skipping this one. 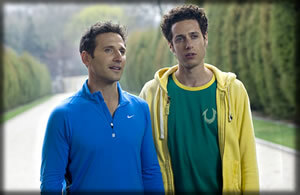 Royal Pains looks good, I think I will tell TiVo to get it for me!